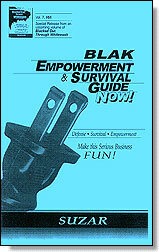 Effective, practical strategies & tools for your Personal Empowerment and Survival. Effective ways to protect and heal ourselves, awaken and "Come-To-A-Point" thus "Come-To-Power." Work these strategies in increments. Make this serious business FUN ! #2: "Gift" your TV/Computer with ORGONE /Sacred Geometry.